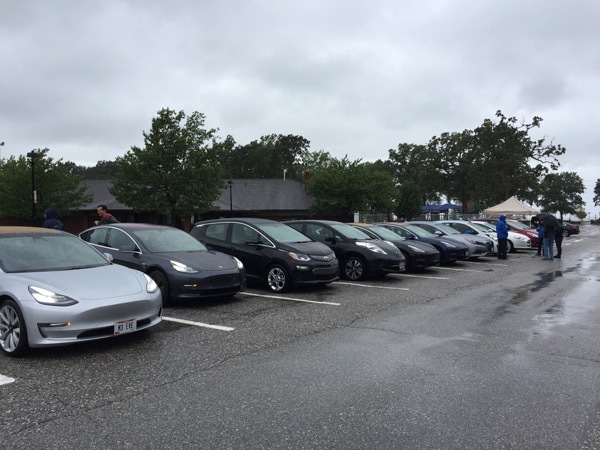 Despite the solid rain during the entire event, at least 16 vehicles representing ten different models along with 50 or more attendees shared stories and rides through Lakewood Park. Joined by City Council Member Tom Bullock, the group of EV drivers, both new and familiar faces, included brand new (one picked up his car just 5 days prior) and long-time EV enthusiasts. Four Tesla Model 3s joined by two Nissan LEAFs, Chevy Bolt, Chevy Spark EV, Hyundai Sonata Plugin, Ford CMax Hybrid, Ford Focus FFE, and FIAT 500e. Lakewood is pleased to participate for the second year in National Drive Electric Week. Join electric vehicle owners and enthusiasts from Drive Electric Northeast Ohio to see various makes and models of EVs and even take a ride through Lakewood Park in one. Registered attendees report 522,216 electric miles driven.